Bake a potatoe till soft. Cut length wise and scoop out the insides so that a thin layer of potatoe remains. Brush the potato with melted butter and bake.Or deep fry. Bake ( 350*F)untill a nice golden brown. Place shredded cheese and crumbled bacon and chopped green onion on top and put back in the oven untill cheese is melted. 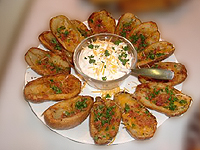 Serve with sour cream sprinkled with parsely on the side.